Buying the best drain cleaner can help you get rid of the stubborn clogs easily, but in some cases using a homemade drain cleaner can be enough. If your water is moving slowly and your drain is not completely clogged you can try the following homemade drain cleaner recipe to mix your own solution to solve the problem. While the homemade cleaners are less powerful, they have an advantage of being non-toxic. Also, you can usually find the needed ingredients in most households so you don’t have to go out and get any additional chemicals. Mix 1/3 cup of soda with half the cup of vinegar to make a fizzy solution. Pour the homemade cleaner down the drain. Make sure you pour the content as quickly as possible, because the fizzing action will eventually slow down making the cleaner less powerful. There is also a different way of using soda and vinegar mix. If possible, pour 1/3 cup of baking soda directly into the drain. Then follow by pouring ½ cup of vinegar. That way ingredients will mix together directly in the drain making the solution more powerful. Once the foam settles, you can pour some more vinegar until the soda is dissolved. Tip: Do not use too much baking soda in the drain as it will not allow vinegar to mix properly. 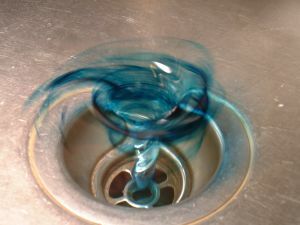 After using one of the above methods leave the homemade drain cleaner in the drain. Do not use your sink or tub for at least half an hour to allow the cleaner to do its job. Afterwards, run hot water for a few minutes to clear out any debris. You can also use the homemade drain cleaner solution mentioned above for drain maintenance. This cheap and non-toxic way can help you prevent from suborn clogs if used regularly. For just pennies you can keep you drains clean and fresh without using any harsh chemicals.